The promotion is presented by the Australian Trade and Investment Commission (Austrade), the Victorian State Government, and Meat and Livestock Australia (MLA). It will run from 20 June to 20 August. 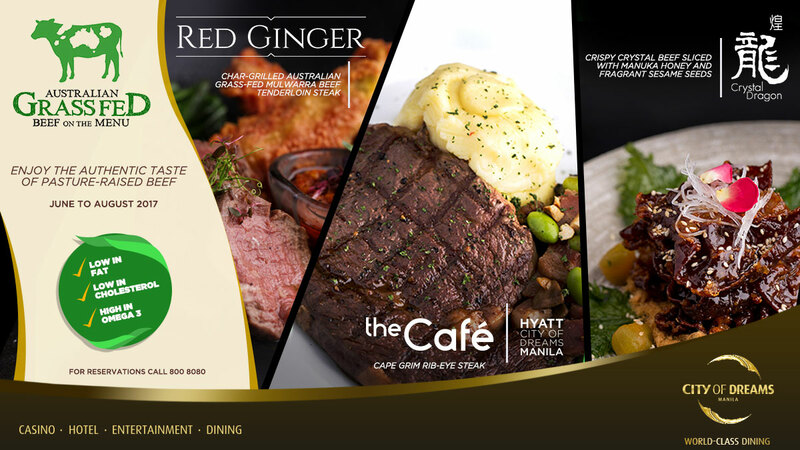 Australian Ambassador to the Philippines Amanda Gorely invites diners to experience the different ways Australian grass fed beef is prepared in customised menus by the participating restaurants -from steaks, meat pies, burgers, pasta dishes, among others, served in a la carte and buffet menus. Australia is the leading source of grassfed beef, as 97% of its cattle are grassfed. Australian grassfed beef is considered as the healthier beef, as it is naturally low in fat and cholesterol, while offering a high level of Omega 3 fatty acids known to lower blood pressure and reduce the risk of certain cancers. 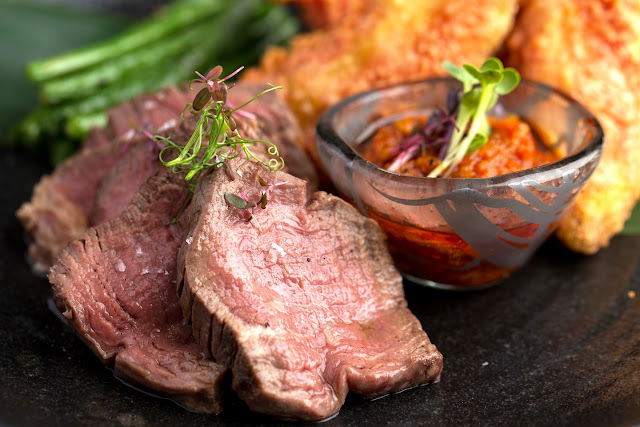 A culinary experience awaits diners in Metro Manila, Cebu and Davao as over 60 restaurants participate in the second Australian Grass Fed Beef on the Menu Promotion. The first Australian grassfed beef experience was offered to Manila diners in 2015 but this year, it has been expanded outside Manila. 1) Dusit Thani Manila: The Pantry - "Holy Cow"
In this campaign we have set our own schedule date to choose which restaurants are we going to visit. July 04, 2017 Tuesday - four restaurants we have visit namely True Grill, Crystal Dragon & Red Ginger, Black Bird, and Green Pasture. 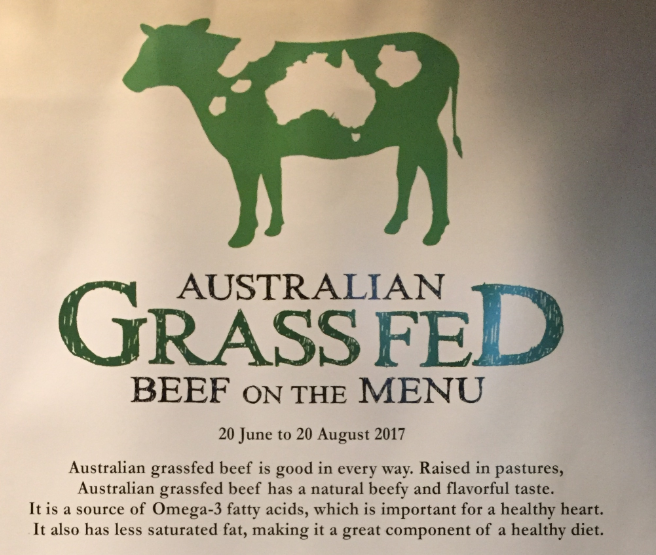 This four mention restaurants participates in the promotion of Australian Grass Fed Beef. On the later part I will highlight the menus they offer with Australian Grass Fed Beef. TRUEGRILL is a great STEAKHOUSE but described simply as a MEAT LOVERS'CAFE. Some people sometimes feel intimidated when they see a restaurant described as a Steakhouse. For them, a Steakhouse is automatically associated with very expensive steak dinners or steak lunches. In fact, the opposite is true. Many of their customers find that their steak prices are easily at least one-half the prices in five star hotels. And again as many of their customers will say, the quality of their steaks can even surpass the quality of Chef-inspired steak recipes in top hotels. To make people more comfortable with their menu, They have included a variety of items such as their 100% Pure Angus Burgers, Quick Dine-In and Take-Out Meals, Steak Sandwiches, Pasta dishes and even some Filipino cuisine dishes. But their greatest pride lies in their Great Southern Pinnacle Ribeye Steak sourced from the biggest meat processor and exporter in all of Australia, JBS Australia. While the US grading system is broken down into Select, Choice and Prime, the Australian grading system as evaluated by Meat Standards Australia is based on EATING QUALITY and ranges from 3, 4 and the highest grade at 5. Their Pinnacle Ribeye is almost always at Grade 5. There are many cuts of Australian beef, prime and non-prime, but their Pinnacle Ribeye Steak is by far the best among the best. RLGC Foods Enterprises (RLGC) started operations in September 2009. It is a fully-accredited and licensed importer of meat and meat products, and it is also the exclusive importer and distributor of high grade Australian beef under the brand name "Melbourne Prime." RLGC's sister company in Australia, Melbourne Prime Kood Exports, is responsible for choosing and testing the finest beef in Australia in strict compliance with rigid international quality and food safety standards. The True Grill Meat Lovers' Cafe Utilizing the superior quality of the Melbourne Prime Gourmet meat selection, The True Grill Meat Lovers' Cafe was opened to the public featuring Chef-inspired variants of classic steak dishes as well as steak sandwiches including Angus Roast Beef, Cheesesteak. Tenderloin and Club Sandwiches. The Cafe recently introduced its 100% Pure Angus Gourmet Burgers. For busy Executives, the Cafe' also introduced Quick Meals and Take-Out Menus, Soup and Pasta Specials. This is my plate full of the menus they offer and all of them are very tasty. The beef are soft and juicy definitely Grassfed Beef is the best of all. giving. In mid-2013, the Company opened its True Grill Meat Lovers' Cafe with its FINE-DINING MENU due to the many requests of numerous Meat Lovers. Next restaurant we visit is the Crystal Dragon and Red Ginger located at City of Dreams Manila. July 4, 2017 – The premium flavor, leaner meat quality and over-all healthy benefits of hormone-free and antibiotic-free certified Australian grass-fed beef is the focus of the curated lunch and dinner a la carte menus currently offered in two of City of Dreams Manila’s signature restaurants – Crystal Dragon and Red Ginger. 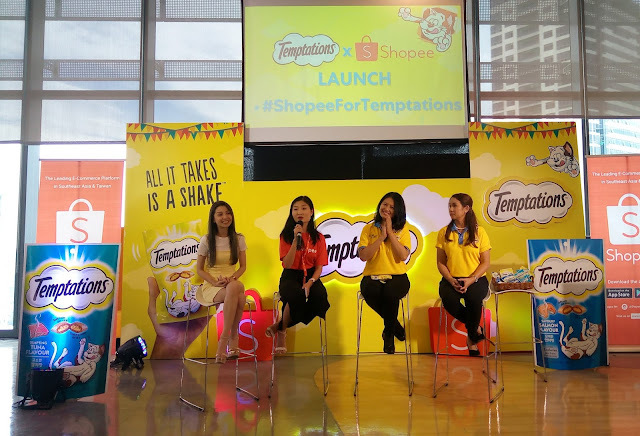 The promotion is held in conjunction with the Australian Embassy in the Philippines, Australian Trade and Investment Commission (Austrade), Victorian State Government, and Meat and Livestock Australia (MLA) with participating outlets in the city. Beef “Luc Lac” (Wok Flamed Australian Grass Fed Beef Cube Roll with Watercress & Rocket Salad). 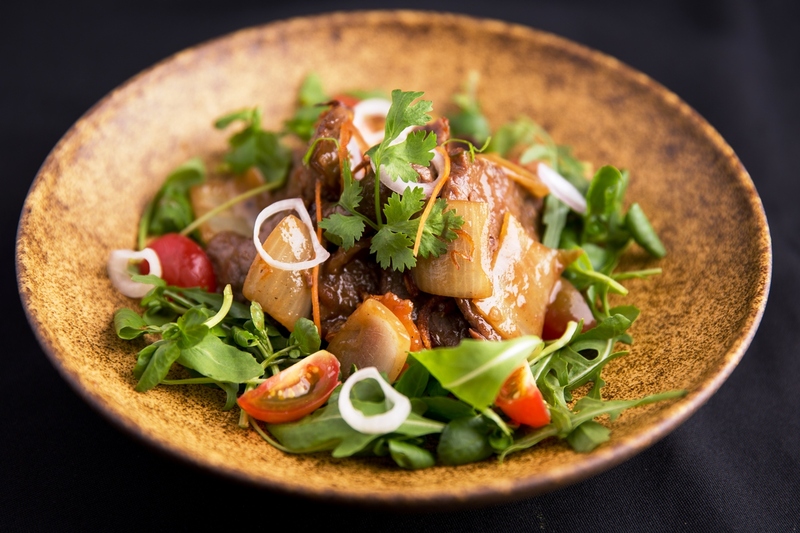 For diners seeking Southeast Asian cuisine, Red Ginger’s selection will incorporate regional flavors and spices complementing Australian grass-fed beef. Four a la carte dishes created by the restaurant’s chef de cuisine Sam Kin Hue will be made available during the promotion until July 17, comprising of: Char-grilled Mulwarra Beef Tenderloin Steak (served with Balado sambal sauce, hand-cut potato wedges, and tossed green beans); Vietnamese Beef “Luc Lac” (wok-flamed beef cube roll with watercress and rocket salad); Indonesian Beef Satay (with Sambal Matah, roasted eggplant, crispy shallots, and steamed Jasmine rice); and Thai Beef Massaman Curry (slow-cooked beef oyster blade in fragrant cashew and spice paste, coconut cream, and steamed Jasmine rice). Crystal Dragon’s exclusive a la carte menu, available until August 23, highlights chef de cuisine Chan Choo Kean’s creations using traditional Cantonese and Chinese cooking techniques. During the entire promotion, six exceptional fare are on the menu: Crispy Crystal Beef Rump Sliced with Manuka Honey and Fragrant Sesame Seed, Smoked Tea Beef Short Ribs Served with Pickles and Fried Homemade Bun, Wok-fried Grass-fed Beef Tenderloin with Asparagus in Sichuan Pepper Sauce, Stir-fried Diced Grass-fed Beef Sirloin with Vegetables and Mushrooms Served in Crispy Golden Cup, and Pan-fried Grass-fed Beef Sirloin Rolled with Enoki Mushrooms in Barbeque Sauce. 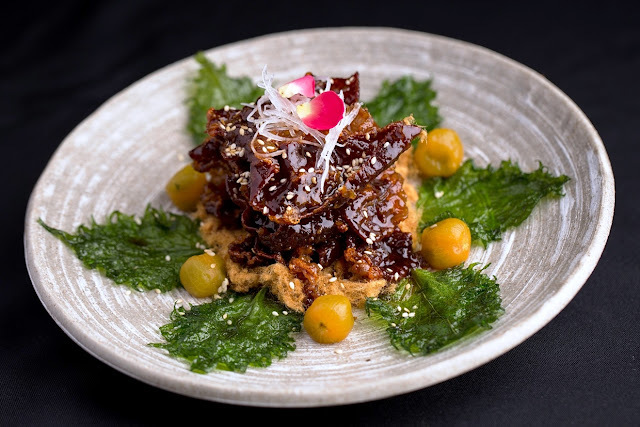 Crispy Crystal Beef Rump Sliced with Manuka Honey and Fragrant Sesame Seed. Grass-fed beef comes from cows that eat a natural diet of grass throughout its life, compared to the more common grain and supplements-fed cattle. This makes it a healthier protein. Benefits include less overall fat, more heart-friendly Omega 3 and Omega 6 fatty acids, more conjugated linoleic acid (CLA) to reduce heart disease and cancer risks, more precursors such as Vitamin A and E, as well as cancer-fighting antioxidants compared to grain-fed meat. 3rd restaurant we visit is the BLACK BIRD - THE HISTORIC NIELSON TOWER IN THE AYALA TRIANGLE AT THE HEART OF MAKATI. 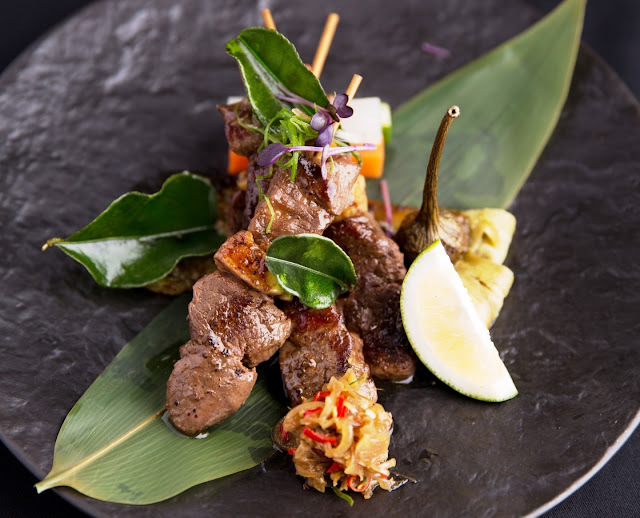 OUR ECLECTIC MENUS, INSPIRED BY THE AVIATION HISTORY OF THE BUILDING, COMBINE WORLD CLASSICS WITH CONTEMPORARY ASIAN COOKING..
A GREAT PLACE TO MEET FOR COCKTAILS BEFORE DINNER WHETHER AT THE ERAMOSA MARBLE AND BRASS BAR OR IN THE VELVET CLAD SOFAS AND JEWEL TONED ARMCHAIRS OF THE CHIC LOUNGE. APERITIVO WITH COMPLIMENTARY SAVOURY SNACKS IS SERVED EVERYDAY FROM 5PM TO 7PM. Here in Green Pastures, they build their menu by looking at what’s around them. All their produce come from farms, ranches, and fisheries guided by the principles of sustainability. They work hard to bring you seasonal feasts straight from our local farms. They know the story of each ingredient they serve. They believe in community, in giving back to nature and to the people who nurture. They stand for sharing life, talents and opportunity to a community. They cultivate lasting relationships with people they touch through the food they prepare. Their menu changes frequently, as they work closely with what is available in their partner farms. Drop by any of their branches to see what's in store this season.